Although many Spanish people seem to use their cars for even the shortest of journeys, the fact is that many of Spain’s cities, towns and villages are small enough and the weather is pleasant enough for you to go almost everywhere on foot throughout the year. For longer trips, you’ll find the underground (there are metros in most major cities) and bus services which are generally efficient, frequent and cheap. 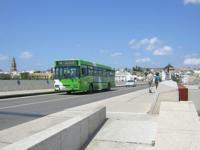 A 10-journey bus pass (called a bonobus) can be bought at news kiosks or tobacconists (estancos.) When waiting at municipal bus stops (marked by a post or bus shelter), make a hand signal to the driver when the bus approaches, as it might not stop otherwise. Painted uniformly in each city or town and with a light on the roof, taxis are easy to distinguish from other vehicles. If a taxi is free, there should be a green light on and the word libre should be visible. If it already has passengers, it should show a red light with the word ocupado. You can flag one down in the street, go to a taxi rank or order one by phoning the local taxi-booking service. There are surcharges for baggage, travelling late at night or at weekends, as well as travelling on local or national holidays. Although it is not common to tip, it’s polite to round-up the cost. You should be aware that it is compulsory to wear a seat belt whether you are sitting in the front or back seats. Thanks to European Union grants, bicycle lanes are appearing all over Spain. 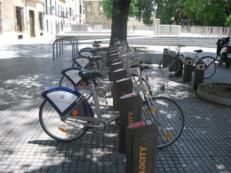 If you don’t have a bicycle of your own, some local councils (in Seville and Cordoba for example) have bikes you can borrow. All you need to do is register for the service at the town hall and then you can borrow bikes from the various bicycle parks around the cities, returning the bike each day to any one of the bicycle parks before the time stipulated in the local council’s regulations.